The only woman minister in the SAD-BJP government, Bibi Jagir Kaur (57), resigned today after she was convicted and sentenced to five-year imprisonment by a CBI court here for conspiring in forcible abortion and abduction of her daughter Harpreet Kaur, who died 12 years ago. 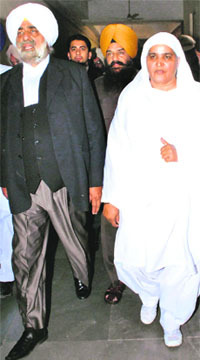 Kaur, however, was acquitted of the murder charge. Putting the newly elected Shiromani Gurdwara Parbhandak Committee (SGPC) board in limbo, the Supreme Court today allowed the executive committee constituted in November 2010 with Avtar Singh Makkar as its president to manage gurdwaras and institutions under the SGPC till further orders. The Supreme Court today dismissed a PIL seeking relief to Balwant Singh Rajoana, sentenced to death in July 2007 for his role in the assassination of Punjab Chief Minister Beant Singh in August 1995. Just three days after PM Manmohan Singh came up with an assurance to South Korea on the Posco project in Odisha, the National Green Tribunal today suspended the environmental clearance given to the controversial multi-crore steel project and asked the Environment Ministry to review it afresh. Demolition of the biggest Hindu temple in Russia is imminent now after after an arbitration court in St Petersburg ruled in favour of the state institution that sought cancellation of the lease deed with the Vedic Society for Spiritual Development managing the Temple in the area. Finance Minister Pranab Mukherjee brought some cheer to the stock markets on Friday when he clarified that participatory notes (P-notes) used by foreign investors in the Indian stock markets would not be taxed. The stock markets reacted to the announcement with the BSE Sensex closing at 17,404.2, up by 350 points. As the CBI today registered a case on the supply of all-terrain Tatra trucks for the Army, the government said Defence Minister AK Antony had sanctioned a probe into �a case relating� to Bharat Earth Movers Limited (BEML) on February 21 this year. The government, it seems, wanted to convey that the minister acted much before Army Chief General VK Singh bribe allegations hit headlines on March 26. The General had alleged that he was offered a bribe of Rs 14 crore by a lobbyist for okaying a deal for 600 �substandard� trucks.